Hello everyone and happy Monday morning! As we are cleaning up at Spellbinders headquarters in anticipation of new carpet and paint, we came across a LOT of scraps of paper. Ah…then we had to decide what to do with all of it. Can you relate? 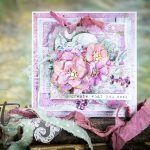 Here is a simple project that Michelle created using the new Spellbinders Labels 50 Nestabilities die and those bits and pieces of paper. First: she selected a scrap piece of paper and die-cut the area she wanted. Then: she matted it onto another larger die-cut piece of solid-colored cardstock. The patterned piece of cardstock was awesome because it already had a sentiment included. 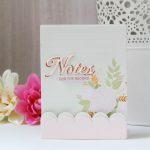 You could always type or stamp out your own and attach to your die-cut piece. Finally: A matted square of cardstock with a ribbon tied around the top square was attached to the card base. For embellishing, she added just a few sequins. So easy, cost effective and resourceful. 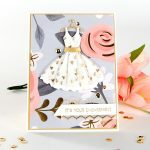 This is a quick and happy card for just pennies. What do you have in your stash of findings? Bet you could create this card too! We would love to see pictures of your creations in the comments.